A perfect combination of creamy peanut butter and whole grain wheat and oats. Nature Valley Soft-Baked Filled Squares have a unique texture of whole grain wheat and oats combined with a creamy peanut butter filling for a delicious snack to help keep you full. Our recipe includes no artificial flavors, artificial sweeteners and no artificial colors. Ingredients: Whole Grain Wheat Flour, Sugar, Peanut Butter (Peanuts), Whole Grain Oats, Canola Oil, Chicory Root Extract, Palm and Palm Kernel Oil, Vegetable Glycerin, Cocoa, Natural Flavor, Egg White, Salt, Baking Soda, Nonfat Dry Milk. 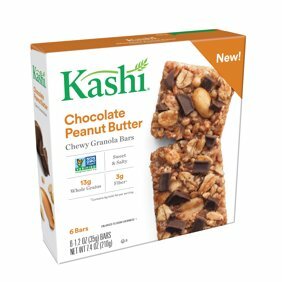 Love these to snack on, but can't always find them in stock. So glad to find the larger box and to be able to order them online whenever I want. Where is the peanut butter? These look nothing like the photo on the box. There is little peanut butter and the whole snack is pretty dry. It tasted fine. Definitely not as advertised. They were super dry and had hardly any peanut butter inside. Ended up throwing over half the box away, no one in my house would eat them. So sorry for any disappointment! We appreciate your feedback and will share it with the rest of our team. Please contact us by phone: 1-800-231-0308 or visit our website www.naturevalley.com so we can make it right. Thank you!